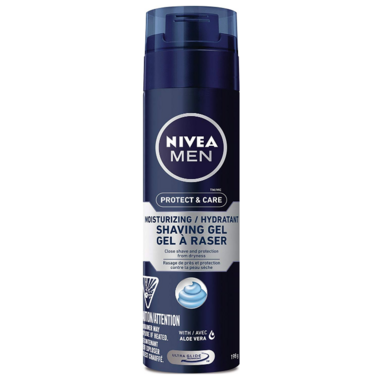 Frequent shaving and changing Canadian weather can be harsh on your skin, give it the trusted care of the NIVEA MEN Protect & Care. The MOISTURIZING SHAVING GEL softens your beard hair and gives you a smooth razor glide. The formula with Aloe Vera and Pro-Vitamin B5 cares for your skin and protects it from drying out. Professional care technology specially developed for normal to dry skin. Enriched with Sea Minerals and vitamin F, the formula helps to prevent moisture loss and to keep the skin healthy-looking. Protects against damage caused by dry skin after shaving. Been using this nivea product for a long time. I get it cuz it is cheap and smells okay.